Today I’ve finally laid eyes on a copy of Paula Morris’ Rangatira, and this has set me pondering the connections of Lindauer and the mana whenua of Waiwhetu, Lower Hutt. But firstly let’s acknowledge the book Rangatira – winner of the New Zealand Post Fiction Category Award, 2012. Rangatira : a novel / by Paula Morris. In this book Paula Morris recreates the story of her tupuna, Paratene Te Manu , one of the rōpū who sailed to England to visit the Queen, under the umbrella of William Jenkins of Nelson – a journey recorded in the book, Hariru Wikitoria! : an illustrated history of the Maori tour of England, 1863, by Brian Mackrell. There is much information on Gottfried Lindauer, and an interesting place to begin is Te Ara– where he is described as a Czech, named Bohumir, born 5 January 1839 at Pilsen, Bohemia. After being called up for service, 1873, he set sail for New Zealand, arriving in Wellington aboard the Reichstag, 6 August 1874, before moving on to Nelson where, says the DNZ biography, he painted his first Māori portraits. But there is a handful of Lindauer’s portraits of women from Waiwhetu, not included in the substantial New Zealand catalogues (both printed and online). And I am wondering whether these portraits were painted before Lindauer moved on to Nelson. One such portrait, well-known to the Porutu and Puketapu whānau, is of Ruhia Porutu, of local fame. Around 1840 T. W. McKenzie, a teenager, was on the point of breaking tapu by entering Ruhia’s father-in-law’s partially constructed house at Pipitea. Ruhia threw her kaitaka over the boy, thus saving his life. An image of the cloak, (which was itself included in the recent exhibition of beautiful kakahu – Kahu ora – at Te Papa), is preserved in a portrait by Lindauer and mentioned in several publications, including “The book of New Zealand women”, as well as our Wellington City Libraries’ book series: Ngā Tūpuna o te Whanganui-a-Tara. Many years ago, at whānau gatherings down Coast Road, Wainuiomata, on Sunday evening get-togethers and sing-alongs, I would gaze up at three portraits on the wall above the mantlepiece. All were unsigned works. Two of the women were portrayed in very clear lines – Keti Kautarewa, and her daughter, Raita Te One. When I asked who had painted these portraits, my mother merely said “Some foreign chap came off a boat, at Wellington Harbour. 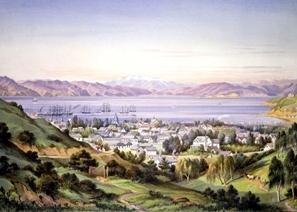 The people of Waiwhetu were good to him, so he painted their portraits”. These two portraits, now attributed to Lindauer were hung in Te Papa, during the Te Ati Awa exhibition, February 1998-August 1999 along with his portrait of Ruhia Porutu, and another of Wi Tako Ngatata. As stated in his biography, Lindauer produced many paintings of scenes and people. I wonder how many other uncatalogued but valued portraits of whānau exist throughout the motu. Lindauer, settled in Woodville, with his wife, in December 1889, on their return from Britain, and he died there in June,1926.